OUT OF PRINT. There are a limited number of copies on Amazon.com. If you would like a digital copy of this book, please email me at ARosenspan@aol.com and we will try to accommodate you. As you know, a "control" is the best-performing part of your direct marketing program. It could be your best direct mail package, your best advertisement, even your best telemarketing script. Confessions of a Control Freak is a new book that is designed to help you beat your control, and get the results you want from your next direct marketing programs. The book doesn't focus on direct marketing theory — just page after page of specific, practical ideas and techniques you can put to use right away. It includes dozens of case-histories — both successes and failures — and includes chapters on e-mail marketing and advertising as well as direct mail. "Three hundred thirty pages; not a wasted word. That is my conclusion after spending a stimulating day with Alan Rosenspans book. This book is for those who have spent a lifetime in direct marketing as well as those who are simply curious about what direct marketing is all about. The structure of the book is simplicity itself. Rosenspan puts all the direct marketing tools on the table. Then he provides a Golden Arrow  CREATIVITY  to hit a bulls eye time after time. This book is a dream come true." "Alan Rosenspan is not only a genius direct response copywriter, he is also a delightful person. Alans engaging style is apparent on every page of his new book. The book draws you in  with facts, with stories, with illustrations, with persuasive arguments, and with charm  until, by the end, you feel like a genius too." and practical ideas to improve your results. All in a quick-read format." 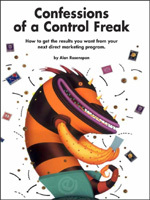 "Alan Rosenspans Confessions of a Control Freak is the best nuts-n-bolts down-in-the-trenches collection of current direct marketing strategy and information, how-to advice, test results and case histories that I have seen. Whats more, its written in simple, declarative sentences  an exhilarating reading experience in this epoch of undecipherable technobabble. Rosenspans analysis of how Southwest Airlines figures its profits  and why it is essential to continually delight every single customer  is worth the price of the book." "Fascinating! Im putting this new gem right at my elbow  along with Caples and Ogilvy and the other great marketing minds who also revealed their tried and true money-making secrets. A modern day classic  and fun to read, to boot!" "If you want a fast reminder of exactly how creative and cost-effective direct marketing can be, read Confessions of a Control Freak. Alan Rosenspans enthusiasm is infectious, his decades of experience are invaluable, and he supplies the scarcest resource of all; real inspiration when its most needed." "Confessions of a Control Freak is packed with so many inspiring, real-life and often witty stories, it reads like a thriller! Most of all, just like in your seminars and speeches, you show us the customer friendly face of our direct marketing." "As part of the Mail Advertising Bureau for New Zealand Post, I will be recommending it to agencies, businesses, everyone. Just buy it, read it and put the ideas into action as soon as you can!" "Confessions of a Control Freak offers superb ideas on how to make your advertising dollars go further; ways to increase the value of your existing customers; and, a noteworthy chapter on how to be sure youve created a high-response offer." "This well structured and easy-to-read book is of enormous value to "newcomers" and those who think they know it all. A great applause for the chapter, "The Future of Direct Marketing." To order the book, click here!